Made this yesterday and it turned out great. As usual your recipe is simple to follow. In a small sauce pan, prepare the caramel by blending the sugar and water in medium heat. Keep stirring it until it thickens and the syrup turns deep amber in color. Turn off heat. Arrange 6 ramekins and add the caramel (in equal portion) into the ramekins. (Save some caramel for topping purposes.) Tilt the ramekins and make sure that the caramel is coated evenly at the bottom of the ramekins. Clean the sauce pan and heat it up (use low heat). Add in the milk and 1/2 cup of sugar. As soon as the sugar dissolves, turn off the heat. In a big bowl, whisk the eggs until blended, and add in the warm milk slowly. Add the vanilla extract and do a quick whisk. Strain the custard mixture into the 6 ramekins and set aside. Arrange the 6 ramekins in a baking pan big enough to fit them. Pour hot water in the baking pan about halfway up the ramekins. Transfer the baking pan into the oven and bake for about 50-60 minutes or until a cake tester inserted in the center comes out clean. Remove the ramekins from the baking pan and let cool. Once they turn cool, transfer them to the fridge and chill them for a few hours. When they are ready to serve, slide a knife around the side of each ramekin to loosen the flan. Turn it out on a dessert plate and top it with extra caramel, if you want. My then co-worker invited me for dinner and his wife made flans for dessert. I remember vividly the first taste; it was a dessert so delicate, beautiful, and sublime—egg custard served in a bath of amber-hued caramel—it was smooth and melted in my mouth. It was the taste of heaven. Since then, I have had many flans in a lot of interesting places—in Texas on my road trip down to Florida; in a traditional Mexican restaurant on a side street in Cabo San Lucas; at a food store in Calistoga; most recently, in Cannes where the flan was rather different in taste, shape, and form; and countless more. None of them beats the flans prepared by my ex co-worker’s wife. I got the flan recipe and have kept it with me for years. I made these flans the other day, and they were a great success. Enjoy! Arrange the 6 ramekins in a baking pan big enough to fit them. Pour hot water in the baking pan about halfway up the ramekins. Transfer the baking pan into the oven and bake for about 50-60 minutes or until a cake tester inserted in the center comes out clean. Remove the ramekins from the baking pan and let cool. Once they turn cool, transfer them to the fridge and chill them for a few hours. When they are ready to serve, slide a knife around the side of each ramekin to loosen the flan. Turn it out on a dessert plate and top it with extra caramel, if you want. If the caramel turns solid, heat it up in a microwave for 10 seconds to dissolve it. 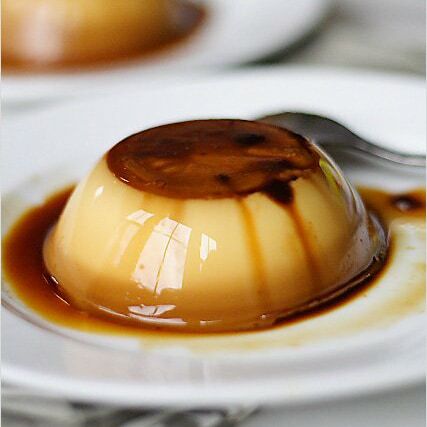 For other flan recipes, try Simply Recipe here . I remember one of my friend posted another version of Flan which is the Filipino version, it’s called Leche Flan and I found the difference in milk. It’s more South-East Asian style, with sweetened condensed milk. flan is my favorite desert to make. so easy and very impressive looking. the photo is so beautiful that its good enough to eat!!! yummmy!! Amazing pictures…Flan are very easy to prepare but are so good! Iv been meaning to make these myself for a long time. This sounds easy enough for a dessert-challenged like me. hehe. Will def try it out. so easy and so looks so delicious! Crème Caramel is my favourite! Fantastic dessert. I’m not a big fan of flan but I can be tempted. Your pics are certainly tempting. Those look so nice and smooth! I’ve yet to make flans, but you should check out a Filipino recipe! It has only sweetened condensed milk! Yowzah! Even though the versions available nowadays may be far off that what the Brits would call as creme caramels, they are still delicious and the most sinful are usually made by our very own sweettoothed Kelantanese who does not stinge on the eggs. Cheers! Vkeong – the last time I had Bangkok Lane mee goreng was 1 year ago, it was still good. For Edgecumb Road, the last time I had it was in late 80’s unfortunately. I am sure a lot has changed since. Mumuchi – I grew up in Penang and Ramadhan Bazaars are not something common there. Yeah, I have never had flans before until I came to the US. I have never officially eaten Flans yet, though I must admit, that looks very tasty. Might be going to Chicago in a month’s time. Anywhere I should look out for for good food? bee the first pic of the flan is absolutely gorgeous. Love the reflection of the window on it and the tones ….lovely. This is hands down my favourite dessert. Gorgeous photo! Have a fantastic time cruising and looking forward to hearing all about the binge! Fasting month is just around the corner and creme caramel is my favourite. They sell these at the ramadhan bazaar but not all are good. Thank you fro sharing the cremem caramel recipe. they look easy! My Creme caramel is cooking in the oven. Hope it turns out well. I have never made it before. ^it turned out really well! I boiled the milk with powdered cinnamon, a clove and a whole green cardamom. I strained it before pouring it into the egg mixture. Thanks! I never knew flan could be so easy! I’ve made this 3 times now and my husband is addicted. This flan is a lighter rendition of my parent’s which I think involved condensed milk. But, I don’t miss the condensed milk at all! This is the second recipe I’ve tried of yours and I ain’t stopping. A tip for those using ramekins – I find that using a knife to skim the sides/circumference will entice the caramel to spread their goodness all over. I had a problem that some caramel would stick to the bottom of the ramekin because I refrigerated mine for later consumption – but the trick above solved that problem. The great thing about Orange County is that due to how close it is to the border, we have authentic flan at high end place such as Javiers. Made this yesterday and it turned out great. As usual your recipe is simple to follow. Will definitely make it again! Thanks for such a good recipe. By the way you also have to make the difference between a flan, a flan patissier, a creme caramel and a creme brulee (with accents : flan, flan pâtissier, crème caramel, crème brûlée). Hi, i will try your recipe, my own version is the steam one instead of baking it. It is very simple and easy. Hi! I’m surprised you have not seen/had caramel custards in Malaysia! I’m from Ipoh and as a kid my favourite part of eating out on a casual weekend was having one of these puddings after a yummny chicken rice meal. Many coffee shops and hawker centers have signs on the walls indicating “Caramel custard available”. It’s so good, I have learnt to make it at home in case the craving hits. My caramel did not turn Amber.. it thickened but it was clear.. I kept cooking then the water dried and sugar hardened.. what do I do ? That’s very strange. What sugar did you use? Is it cane sugar? For the caramel sauce DO NOT stir while its reducing…only stir till the sugar is dissolved and then leave it. First time I stirred and ended up with sugar crystals. Keep at a med heat-it takes awhile to get that beautiful amber color. I went to light on the serving size with the sauce and ended up having to reheat the solid left over caramel sauce to use it up. Tasty recipe. Hello, if I do not have oven or microwave. Is there alternative to cook this?